It’s perfectly possible to be a religious believer, and still be smart and sane. But that isn’t the target audience for the spam I just got. 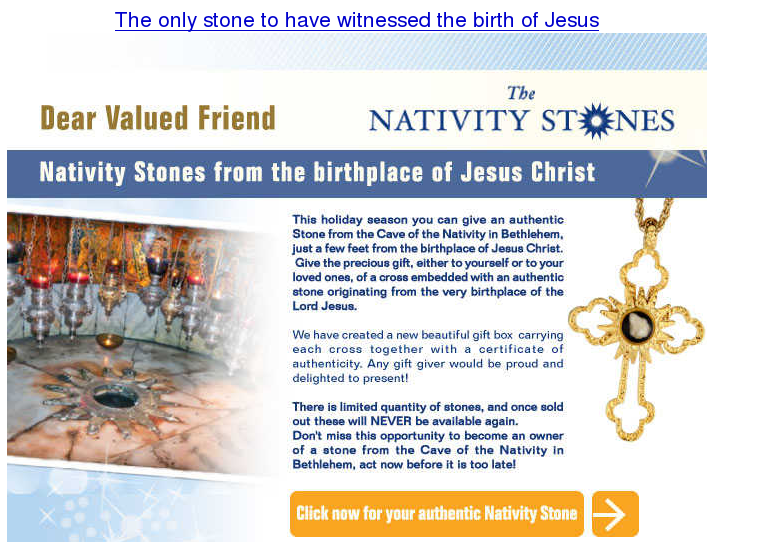 Essentially they’re selling rocks from the “Cave of the Nativity in Bethlehem”. The cave is part of the Church of the Nativity–the reader is meant to believe that the various Catholic, Greek Orthodox, and Armenian Orthodox priests who administer that temple would let pebbles be taken from the cave and sold via email spam. Interestingly, the links go to fundybuzz.com. The spammers obviously know that smart, knowledgeable people won’t fall for the scam, so they aren’t making any effort to hide their contempt from anyone who is awake.